Affinity Diagram: Messy thinking? Scrappy data? Can’t see the wood for the trees? But, there’s help. It has a big name, but is a deceptively simple process. It’s called an affinity diagram. 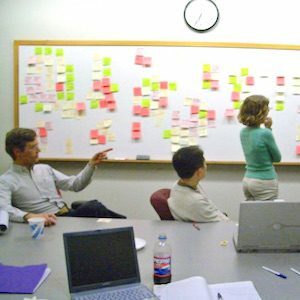 Project managers often make use of the affinity diagram. It was devised by Jiro Kawakita in the 1960s. So things other than hippies happened back then! Jiro is an amazing fellow who devised his KJ Method, based on what he called the Key Problem Approach, largely as a result of his experience dealing with an ecological disaster in a Himalayan village in 1951 (the Sikha Valley Project) after finding dissatisfaction with other anthropological field techniques. His life’s work has been about creating harmony from chaos. You can do an affinity diagram on your own or with a group. Best done in a group—the dynamics and feeding from others’ ideas is really stimulating. You may want to start by using Brainstorming to get the ideas out into the open. The image shows a group using both at Carnegie Mellon University. Now you have groups you will be better able to see interactions or priorities for decision making. The whole process will seem very disorganized and patterns may take quite a while to emerge, but keep at it, or maybe even leave the notes posted, go away and then come back to them later. When you are happy with the groupings, it will be time to start another process. Perhaps the Cause and Effect (or Fishbone) Diagram. If you like doing problem solving on computer, you can get software to make affinity diagrams on line. Then your team can work on it via Dropbox or some other sharing app.